Smoky Pimiento Cheese Deviled Eggs are the PERFECT tasty twist on a Southern classic. The superbly spiced tang of Dijon mustard, combined with a satisfying smoky cheddar cheese and flavorful crunch of roasted red bell pepper is irresistibly delicious. Everyone will LOVE this recipe — including those who despise pimiento cheese! You’ll be tempted to eat all of them yourself — and you probably won’t regret it if you do. Smoky Pimiento Cheese Deviled Eggs are a truly addictive appetizer! The combination of the two favorite flavors completely transforms ordinary deviled eggs into the extraordinary. This recipe is a stress-free stunner. You won’t believe that something so simple could taste so delicious! 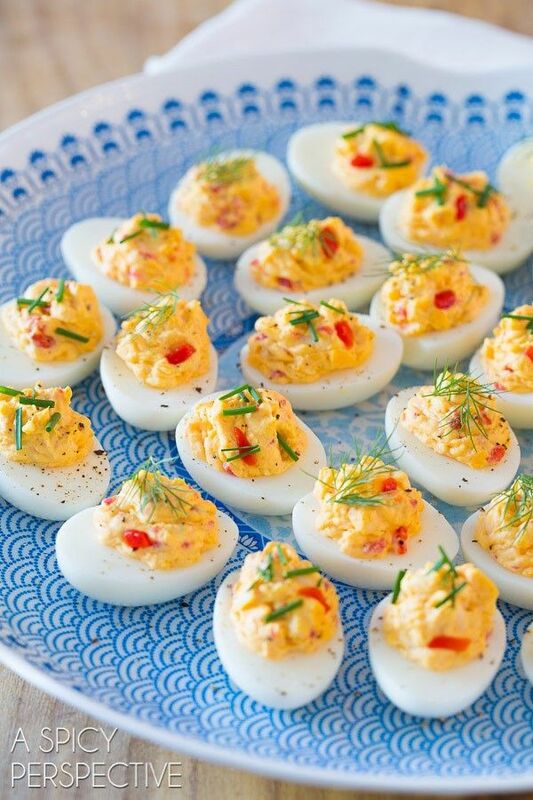 Smoky Pimiento Cheese Deviled Eggs are the perfect appetizer and guaranteed to steal the spotlight at any occasion. Deviled eggs are a classic creamy concoction devoured around to the world for centuries, and pimiento cheese is a bonafide Southern icon. Naturally, this recipe is a magical combination and tasting the legendary flavors is unforgettable. DID YOU KNOW: The roots of modern-day deviled eggs can be traced back to ancient Rome, where eggs were boiled, seasoned with spicy sauces and then typically served as a first course for wealthy aristocrats. In fact, serving eggs while entertaining was so common that the Romans had a saying, “ab ova usque ad mala”—literally from eggs to apples, or from the beginning of a meal to the end. Do yourself a favor and try this recipe as soon as possible! Place eggs in a large stainless steel saucepan (not nonstick). Add water to a depth of 3 inches. Bring to a rolling boil; cook 1 minute. Cover, remove from heat and let stand 10 minutes. Drain. Place eggs under cold running water until cool enough to handle. Peel under cold running water. Cut eggs in half lengthwise; remove yolks. Reserve 6 yolks for another use. Mash remaining 6 yolks with mayonnaise using a fork. Stir in cheese and next 3 ingredients. Season with salt and pepper to taste. Spoon into egg whites. Serve with desired toppings. Recipe adapted from Southern Living and A Spicy Perspective.